For the first time since allegations surfaced of sexual misconduct on the Phillips Exeter Academy campus, the New Hampshire prep school's principal is speaking out. 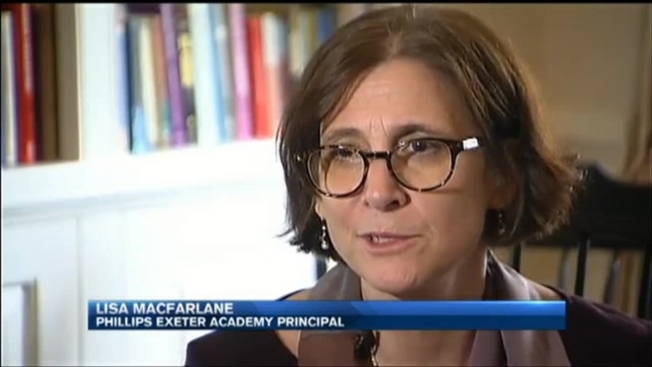 "We are incredibly saddened and remorseful about the actions of the past," said Principal Lisa MacFarlane. The academy has fired two teachers for admitting to having sexual relationships with their students more than two decades ago. MacFarlane says the school has hired an outside law firm to uncover the details. "We are absolutely committed to understanding that past as best we can and we are committed to learning from it," she said. When asked what was happened years ago on campus that would facilitate these relationships, MacFarlane said, "That's a really good question." She also acknowledged fault in the Academy's decision to withhold information about the 2011 resignation of teacher Rick Schubart amid allegations and then a confession. "We've taken responsibility for that and we've apologized for that," MacFarlane said Friday. She says the school has increased transparency, is revising the health curriculum, and opening up dialogue with young students in a unique way. "Just last week we brought in a play written by group of teens in New York that addresses these issues and required all the students and faculty to go and see it," MacFarlane said. "It prompted provocative, thoughtful, lively conversation among students." MacFarlane says Phillips Exeter is working with the Exeter Police Department on a quest for justice, thankful to those victims who prompted the investigation. "We admire so much the courage of the survivors who have come forward and shed some light on a dark thread in Exeter's otherwise often very wonderful past," she said. "We know we have work to repair the trust and confidence in our community." She says the investigation has not impacted enrollment or matriculation.